Speed is an absolute game changer. No matter the age or the sport, faster young athletes can vary the course of any contest. The discussion of genetics versus trainability is undeniably not an “either/or” question any longer. The conversation now becomes how to maximize athleticism in a young athlete as they potentially gravitate toward what activity they are naturally adept at in the realm of athletics. It has been said that roughly 20% of all young athletes who are particularly proficient at age 10 are also dominant later in life as they near and enter young adulthood. My experience over the past 21 years tells me this percentage may be inflated. “My son/daughter was the fastest on field two years ago. Now he is at the back of the pack. He needs more speed.” This is not an uncommon lament for the parents of young athletes. This is not to say that speed training is not important. It is, and it has its place. As coaches, it is paramount to keep the big picture in mind in relation to speed training. Educating parents on the basics of the human development continuum can fall on deaf ears. Yes, growth spurts and peak height velocity combined with puberty can wreak havoc on a young athlete’s ability to perform; this is not new information. That said, how do we promote more speed for young athletes? There are several strategies that all lend themselves to faster, more agile young athletes on the field, court, and ice. It is paramount that your programming be rooted in a comprehensive approach to training the entire individual. Due to the growing and changing nature of a younger child, almost anything you do (within reason) will show increases in force production, explosiveness, agility, and top end speed. While it is likely all “effective,” all approaches are not necessarily optimal. Here are three keys to developing speed in younger athletes 6-13 years old. 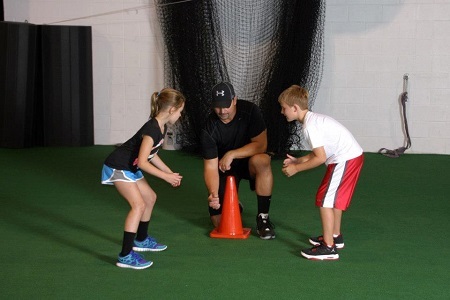 Discovery – allow your youngest athletes to continue to discover movement by giving them opportunity to do so. Create situations for them to explore movement with as little cueing as possible. Skill it, Drill it, Thrill it – Cone drills are great—if the boys and girls you are coaching have acquired the skill sets to run them. Break down the skills first, and follow that up with some fun drills. Anchor those skills with a game that reinforces the skills you were working on. Game Play – Athletes must be given the chance to use the skills they are working on with you in a game situation BEFORE they go back to their respective teams. Bigger engine, new tires, and new brakes on your race car would not be followed by a 300 mile race as the first test drive. Let your kids rip it up in focused games that will allow them to experiment with their new-found skills. Have your athletes practice swinging their arms while seated on the floor. Use cues like “your hands will move from cheek to cheek.” In a seated position, your athletes will be forced to flex the elbows in order to swing. Now use silly runs to allow for exploration and discovery. 1st run – have your athletes run with fast arms and slow legs. 2nd run – have your athletes run with slow arms and fast legs. 3rd run – have your athletes run with fast arms and legs, yet swinging their arms side to side. 4th run – have your athletes run with fast arms and fast legs utilizing the arm skills they learned while seated. After each run, ask your athletes how it felt. Ask them if they were running as fast as they wanted to. Finally, play a game or have a competition where the kids can use their new-found mechanics in a game or competition. Relay races and tag are two of my favorites. Employing these strategies to teach speed should augment a well-rounded and comprehensive program that fosters movement exploration, integrated systemic strength, muscle activation, active range of motion, coordination, and character shaping. As stand-alone drills or activities for speed on a short-term basis, these methods will have a diminished effect. Long-term athletic development is the optimal tactic for the children you serve and in the end will lead to a faster, more injury resistant young athlete, which is why this process is the key to developing speed in young athletes 6-13 years old.